The Russian National Ballet Theatre brings The Sleeping Beauty to life at the State Theatre New Jersey. From the sets and the costumes to the music and the choreography, this iconic production is sure to transport you to the tsarist Russia. Russian ballet was initially developed as a way to challenge the western glory, but it has now taken on a glorious path of its own. 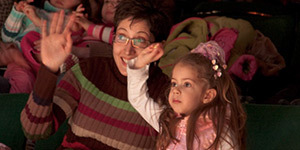 Experience Russia’s national pride through the magical life of princess Arora on March 4. Considered to be one of the most influential choreographers in ballet history, Marius Petipa choreographed The Sleeping Beauty’s original production in 1890. He required precise yet beautiful movements from his dancers, and out came one of cornerstones of ballet repertoire. Still faithful to his creation, RNBT will light up the stage with their graceful and strong dancers. As customary to Russian ballet, the dancers will push themselves to the choreography of this remarkable man, beyond the classic turns and jumps, all in the name of artistic brilliance. One Russian legend paired with another to propel this ballet into the hearts of its viewers. Petipa invited Pyotr Ilyich Tchaikovsky to compose the music for the production and gave him specific requirements to fulfill. Tchaikovsky graciously accepted the challenge and truly captured the grandness of the fairytale. His scores were primarily thought of as unfit for ballet, but have now found a firm seating in the list of classic Russian ballet music. He was the first internationally recognized Russian Composer and composed the music for the legendary Nutcracker and Swan Lake. You can know everything or nothing about Russian ballet, either way, you are guaranteed to appreciate his lovely composition. This production of The Sleeping Beauty has a distinctly Russian background and for good reason. RNBT brings with it elaborate sets and costumes that have overtime come to define Russian Ballet. The colorful and extravagant setting will be a treat for your eyes like no other. As if the music and the dance weren’t enough, the elaborate props further hype up the drama that is Russian ballet. Russian ballet is big, bold, and beautiful with the emphasis on interpretative pantomime and symbolic dancing. Nothing in this production will be short of being labeled ‘big’ especially because Russian ballet produces some of the strongest dancers in the world. RNTB firmly believes that their goal is to “stimulate interest and the need for Russian classical ballet.” The rich cultural heritage that has been passed down for generations is available for you to relish right here in America. Take a little bit of Russia, add some drama of love along with a sprinkle of magic, and immerse your senses in a pot of greatness. So come on Saturday, March 4 at 2pm and 8pm and see for yourself the majesty of Russian Ballet displayed artistically in the life of The Sleeping Beauty.